An EF-1 tornado in North Chemung, NY touched down last week on September 2. According to a Public Information Statement from the National Weather Service in Binghamton, NY the tornado was on the ground for 6 miles and felled numerous trees and also produced some roof and siding damage to a few homes. Additionally, a pickup truck was picked up and moved 6 feet by the strong winds. This is how the storm looked on radar shortly after touchdown. The QLCS (quasi-linear convective system) contained a somewhat unimpressive couplet (rotation) through the tornado’s life. While occasionally exceeding 50 knots of gate-to-gate Delta-V it was generally not particularly intense. 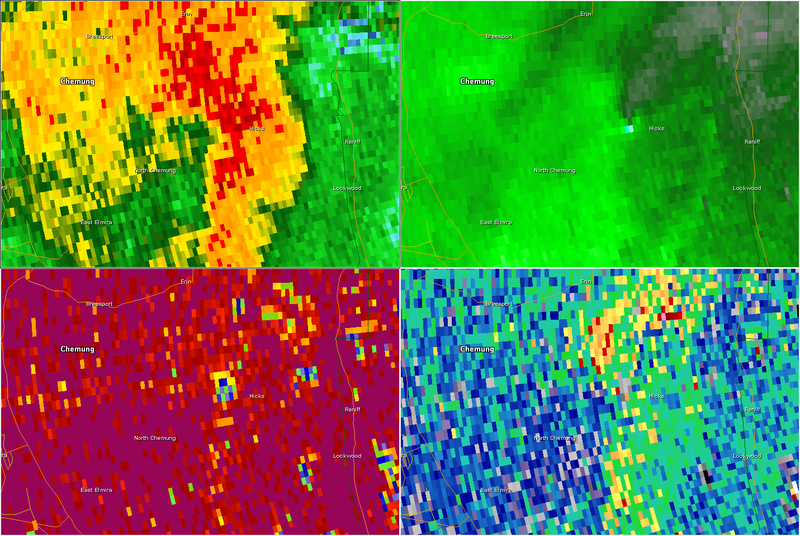 What is impressive is that for 10 minutes – this tornado produced a clear tornado debris signature on radar. 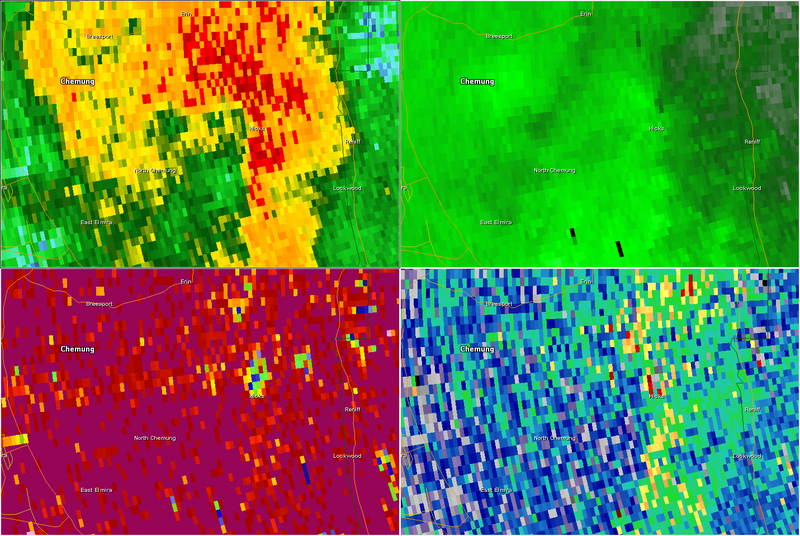 You can see in the above image near North Chemung depressed correlation coefficient and near-zero ZDR – all coincident with an area of rotation and sufficiently high Z (reflectivity). 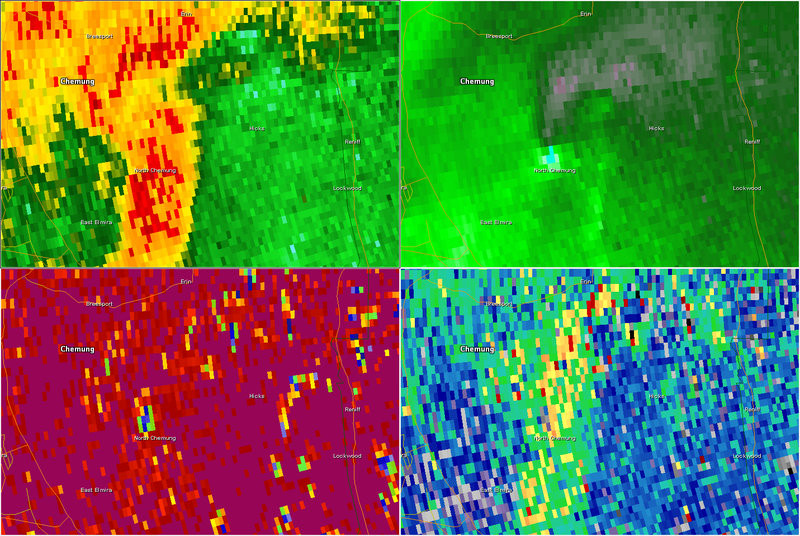 The tornado debris signature on radar appeared from 2309 UTC and disappeared by 2323 UTC. It was on the lowest elevation slice and the debris reached a height of 6,000 ft AGL at one point. What is so concerning about this is that the signature was completely missed by the National Weather Service. No tornado warning was issued for Chemung County, NY. The Severe Thunderstorm Warning in effect for Chemung County contained no mention of possible tornadoes, no enhanced wording about more extreme wind damage, and in fact was a fairly boilerplate warning for a large geographic area including parts of 6 counties. This isn’t the first time the NWS has “missed” a tornado debris signature which is, in fact, confirmation of a tornado touchdown. The Revere tornado this July is one example and Lancaster County PA in 2012. Both of these examples are tornadoes that occurred with no warning. Other tornadoes in the northeastern U.S. that were covered by tornado warnings have occurred with no mention of tornado confirmation by the TDS in statements (May 2013 near Albany). Earlier this year – the NWS in Albany did mention a TDS which is the first mention, to my knowledge, in this area. Given how many tornado signatures on radar in the northeast are fairly “borderline” – dual pol and tornado debris signatures can provide the information needed to pull the trigger. 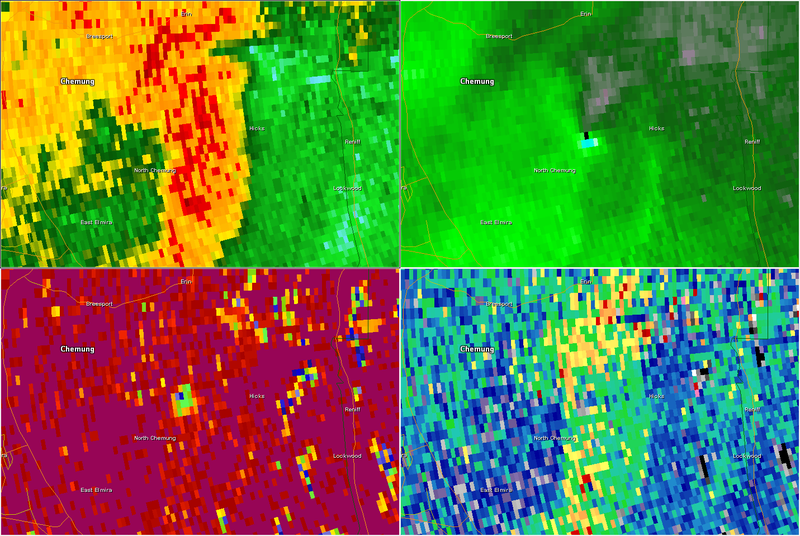 Even weak tornadoes a fair distance from the radar site have produced debris signatures around here! While a TDS can’t provide lead time for the initial touchdown it can certainly give lead time to people living farther down a tornado’s path. If it’s a training issue or something like that within the NWS – we need to fix it! I also implore television meteorologists to become more comfortable interpreting dual pol products. It is certainly possible now to give viewers a “confirmation” of a tornado without someone actually having to see it. Extra urgency in coverage with specific mention of debris being lofted by a tornado can help get people to safety. Being able to explain “what” a TDS is is now just as important as explaining what rotation means on radar to viewers – particularly in New England where tornadoes are relatively infrequent. We have another weapon in our meteorological arsenal – let’s use it and use it well! We should educate the public about what radar indicated/radar confirmed means. We should be very clear and unambiguous about what a TDS means and we should get the word out as soon as possible. If it can’t make it into a NWS statement in a timely – put it out on NWS Chat! If some meteorologists at the NWS aren’t using dual pol products during severe weather operations – they need to start and start now! The lack of a warning west of Binghamton last week with evidence of a confirmed tornado available via radar is completely unacceptable. We can do better and I’m sure we will. 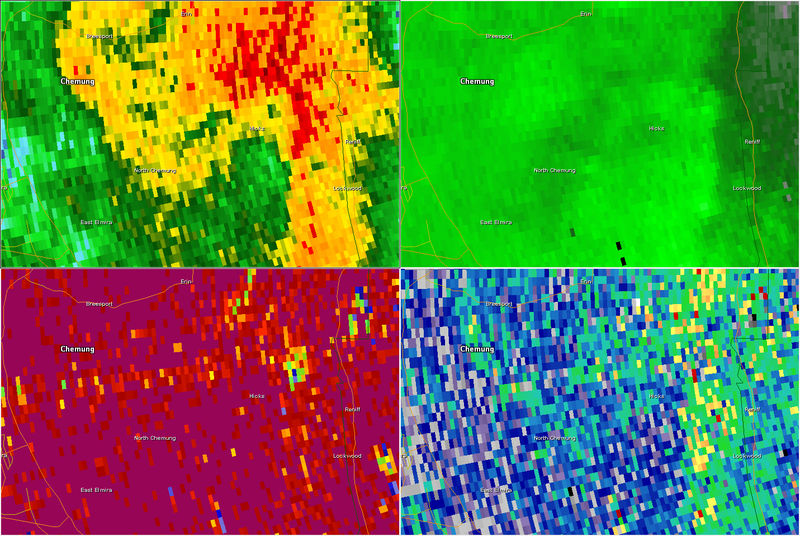 This entry was posted in Uncategorized and tagged Chemung County, TDS, Tornado Debris Signature by ryanhanrahan. Bookmark the permalink.